Relentless Obstacle Race and Steve's Club Camden. Huge thanks to Roger Dickerman Marissa Pellegrino and the entire crew at Relentless Fitness for hosting anothe super fun and challenging obstacle race (with a scavenger hunt in Washington Square Park!) to help raise funds for Steve's Club Camden and Steve's Club National Program. "I've viewed myself as slightly above average in talent. And where I excel is ridiculous, sickening work ethic." Will Smith, the famous actor and musician, said that. He knows that talent only gets you so far. Fame only gets you so far. Connections only get you so far. But a ridiculous, sickening work ethic? That will take whatever talent you have farther than anything else. That work ethic will get you someplace. That's one of the reasons I work so hard to get the hard work message to the kids at Steve's Club: hard work in the gym and outside the gym can become their ticket out of the hood. Once you learn the discipline of going hard and persevering, then you come back again and you learn resilience. Combine those elements in the gym and they will automatically transfer to your work outside the gym. Sets of thrusters and pull-ups have an effect on mindset that is absolutely contagious. Keep working hard and you got a shot at getting off the mean streets and into a better way of life. It's not an easy road, to do the hard work or to preach it. Working with kids from the inner city all these years, I've learned that many of them fall into the trap of thinking that their best chance of success is becoming famous. They want to do one thing and start at the top: professional athlete, rapper, sneaker designer, etc. They're willing to buy the social hype that our media offers: get famous and get yours, hard work optional. But that's a fantasy. Those kids from the poor neighborhoods don't have equal footing with the kids from the rich neighborhoods. They don't have the advantages of a pampered youth and a comfy landing if they fail. The streets are much tougher than that – mistakes have very real consequences, sometimes you pay with your life. And for every LeBron James, there are millions of kids who won't make millions. But our media feeds that fantasy of chasing fame and you'll have easy achievement, and thereby sets these kids up for failure and disappointment. We can do better. We can set these kids up for success and happiness. But it won't come easy. They're going to have to do the work, and they will need role models who are willing to teach them about hard work and why it matters. And that means people like you and me, people who care about kids and communities. People who are willing to show these kids the honor of getting a high school diploma and learning a trade, or getting into a community college and working their way through, maybe even starting their own business. It all starts with hard work. This is the guidance and advice these kids need to hear, and it's a message that we will continue to do our best to drive home in our local Steve's Clubs across the country. Work hard, do the right thing. Good things will happen. Why Do We Say We "Eat Clean" Instead of We Eat Healthy? When did we start saying we are eating "clean" instead of eating healthy? I never really thought about the words we use until all of a sudden it seemed like "clean eating" was everywhere. There were clean eating meal plans and apps and magazine and articles for and against. (Against clean eating? I know, that's what I said too, but apparently the term can sound judgmental or exceedingly restrictive to some folks.) Mostly, I think we didn't notice the trend because many of us have become used to being in the forefront of various fitness and nutritional movements. Like CrossFit. I started doing CrossFit in 2005. Back then, not many people were doing it or had even heard about it. Having a "CrossFit event" meant that you found two other guys crazy enough to do the workouts and you all met at your garage and did some gnarly workout that scared the piss out of your neighbors. Now? There are all sorts of events featuring CrossFit movements, and thousands of people compete in and watch those events. Same thing with nutrition. If you had told somebody in 1999 that you ate "Paleo" they might have looked at you very strangely. The term "Paleo diet" was in use since the 1970's but it didn't really catch on until Loren Cordain published his book "The Paleo Diet" in 2002. And then somewhere along the way, Paleo and "clean" became almost interchangeable, because eating real food made so much sense that what we called it wasn't as important as the fact that we did it. And that's what it comes down to, right? Unless you do the action, it doesn’t really matter what you call that action. So call it clean eating, call it the Paleo diet, call it eating real food. We don't care what you call it as much as we care that you do it. Eating healthy, real food will help you perform better and live a longer, healthier life. Growing up on the harsh streets of Camden, NJ, Ray (23 yrs old) remembers being young and not being about to go outside of the house he shared with his parents and siblings. Ray is the youngest of 5. Ray found Steve's Club Camden five years ago just as he was beginning to follow in his brother's footsteps. "I was hanging around the wrong people, drinking, going to parties. Then my friend told me about Steve's Club." The Club became his safe haven. He had always had a passion for sports, and that helped fuel his passion for fitness. 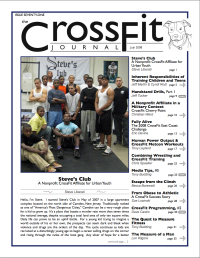 Steve's Club and CrossFit have helped Ray realize his potential and given him new possibilities for the future. He recently earned his Associates in Exercise Science from Camden County College and plans to continue on to Rowan University to finish his four-year degree. In addition to juggling school, Ray works part-time in the Steve's PaleoGoods warehouse. His aspirations include coaching high school track and owning his own gym. 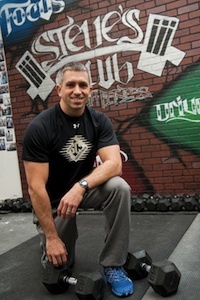 Ray earned Level 1 CrossFit certification last year and coaches at Steve’s Club Camden twice a week. A proven leader at Steve’s Club Camden, Ray leads by example showing the other kids that education, hard work and commitment are their tickets out of the hood. Ray is a role model for the other Camden athletes and truly exemplifies the 9 Steve's Club Values (integrity, respect, improvement, teamwork, positivity, support, discipline, character & community). He shows up every day and puts in the work - and it shows. He can clean & jerk 275 lbs., back squat 415 lbs. and deadlift 500 lbs. He does 'Fran' in 2:43, 'Grace' in 1:59 and the 'Filthy Fifty' in 18:50.